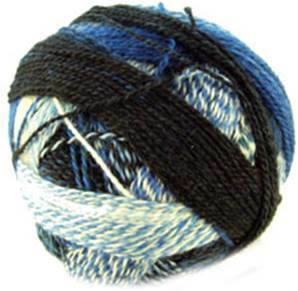 Zauberball Crazy 2099 is a self patterning 6 ply sock yarn in blue, black and white tweed shades from Shoppel Wolle. 75% wool, 25% polyamide (nylon). Machine washable 40'. 150g balls, enough for an average pair of adult socks.